Have you been looking for something truly individual and unique? Something you can call your very own ‘signature scent’. A fragrance to have them all guessing 'what is that'? Haunting, beautiful, mysterious...the embodiment of you? Only to find yourself uninspired by the ‘same-old' (same-new) high street offerings that everyone's wearing already? Since 1996, Woodfordes have been thinking ‘outside of the box’. 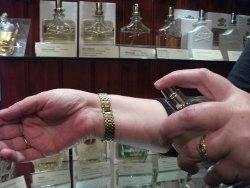 Sourcing original ranges from small, individual perfumeries that rarely make it to department store shelves, some of our fragrances are the creations of new, up-and-coming perfumers; others perhaps are the neglected classics from small, historic perfume houses that modernity has (thankfully) passed by. Whether you are on a journey of invention or re-invention, whether its your first visit or a return to this site, with over 200 fragrance choices in the following pages we'll endevour to have the good scents to inspire you. Welcome to Woodfordes! We hope you enjoy your stay. To read more about our choice of scents, or more importantly perhaps, how to choose the perfect scent for you, we've a range of articles to help you learn more about what goes into your perfume and what will make it right for you. We've also got some great style suggestions.